Today is Thomas Jefferson’s birthday and what better way to honor his love of the garden than getting out in the dirt! 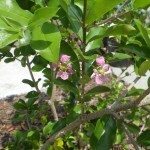 There’s plenty of work at the Tropical Homestead this weekend, like keeping up with the weeds, watering, and planting the blueberries that arrived in the mail this week. But the explosion of blossoms in the garden was a divine distraction. So instead of weeding, I did a photo shoot. I’m sure the 3rd President would understand. Click on any of the pictures for a closer view. 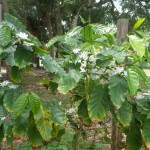 This is the most exciting development this year – our coffee plant is blooming like crazy! If the coffee is half as good as these little flowers smell, I’m setting my alarm early. 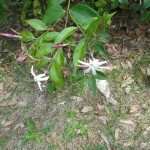 I don’t know if you can make tea out of the star jasmine, but I have to find out. It certainly smells delicious. Walking out to the back lot, we can smell the fruity blossoms on this Marsh Grapefruit before we can even see the little tree. It will be a treat to see how many grapefruit it can hold this year. 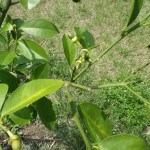 Just a few blossoms left on the Meyers Lemon, but there’s lots of little lemons. 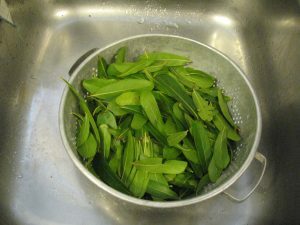 Tarragon, Tarragon, Tarragon. What to say about you?I don’t know any thing about you. I don’t know what we’ll use you in. You were a gift and you taste like licorice. There, are you happy? 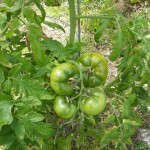 The homestead tomato was bred for hot climates. I think it likes it here. I didn’t take a picture of its blossoms, but this is really what it’s all about, isn’t it? This is a Sunshine blueberry. 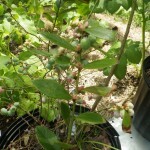 It can produce fruit without the usual chill period most blueberries need.We bought two last season and they out produced the other two blueberries that were more mature. Three more Sunshine blueberry bushes just arrived at the homestead. Life is good. 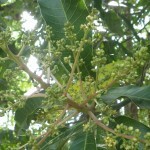 One of our many mangoes ready to pop with little green babies. 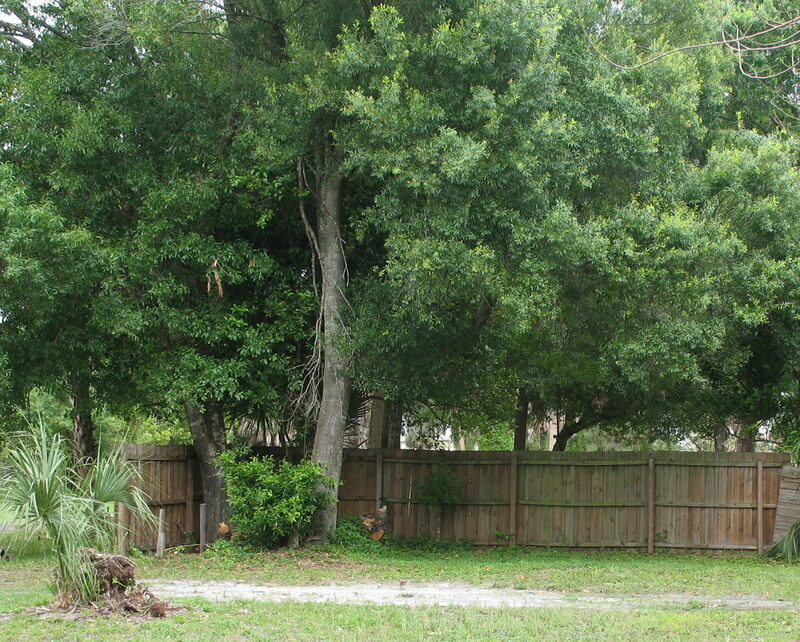 I’d hug it if I weren’t so severely allergic to this tree. 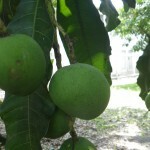 Some of our mangoes got a head start this year. 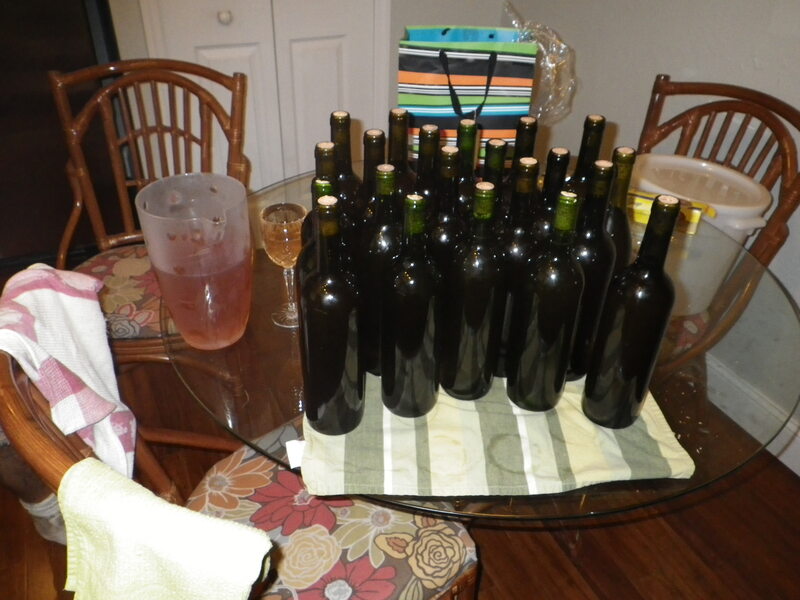 We were lucky enough to avoid a frost, so it looks like mango wine in the fall! 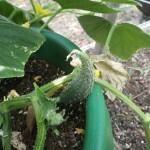 I am sooooo excited that this cucumber is thriving! 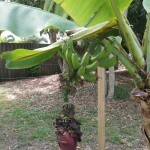 This is the first we’ve grown that really took off. It’s flowers are so sunny! The Eva Purple is just one of 7 types of tomatoes we’re growing this year. 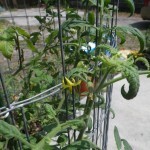 My prediction is that they will all cross pollinate and we will be responsible for Attack of the Killer Tomatoes II. I apologize in advance. The Barbados Cherry is one of our newest editions but, goodness, it is a quick study. 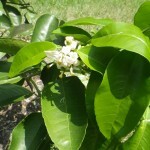 We have already made some wine from the fruit in the fall, and it’s already blossoming for next season. The fruit looks just like a cherry, but it’s not very sweet and has a bit of a ‘green’ flavor. Not for eating out of hand, but we think we’ll enjoy some jam and maybe (definitely) more wine. 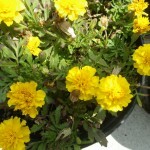 Although not technically part of our edible landscape, marigolds are our beautiful warriors. 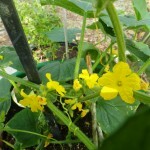 They keep aphids at bay and that makes our garden more productive. Carry on, Lil’ yeller. Flax is one of Clay’s secret ingredients in his famous bread (shhh!) If you haven’t added flax to your diet, go get some! Right now! It’s a superfood. It’s also super cheap -even at boutique health stores. 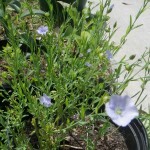 Not one of our more cost effective plants, but its flowers are so blue and happy, we can’t help growing it. 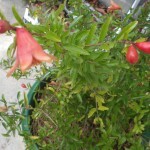 We got one tiny pomegranate from this bush last season but by golly it was packed with tart-tangy goodness. We’re looking forward to a bumper crop this year. 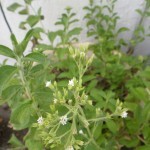 It’s the basil leaves you want; you can trim the buds off and the plant will put out more branches. 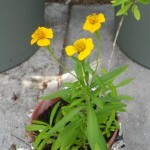 But the flower lets you know the plant is mature and its leaves will have a bold, robust flavor. 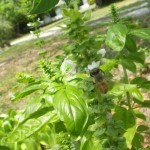 Besides, who could say ‘no’ to this little honey bee? Stevia is a natural sweetner that is reportedly 30 times sweeter than sugar. You actually don’t want to have it blossom as it imparts a bitter taste to the leaves but…pretty! We’ll let this go to seed and we’ll have sweet baby leaves before you know it. This is Kramer. He is not edible and he is anti-landscape. 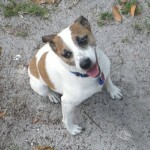 He’s Griffin’s adopted dog and he was jealous of all the attention I was giving the plants. So now he’s a STAR! The pending storm threw a wrench in our weekend, but we were fortunate enough to have a few hours of clear sky and calm wind to get into the beehive on Saturday. 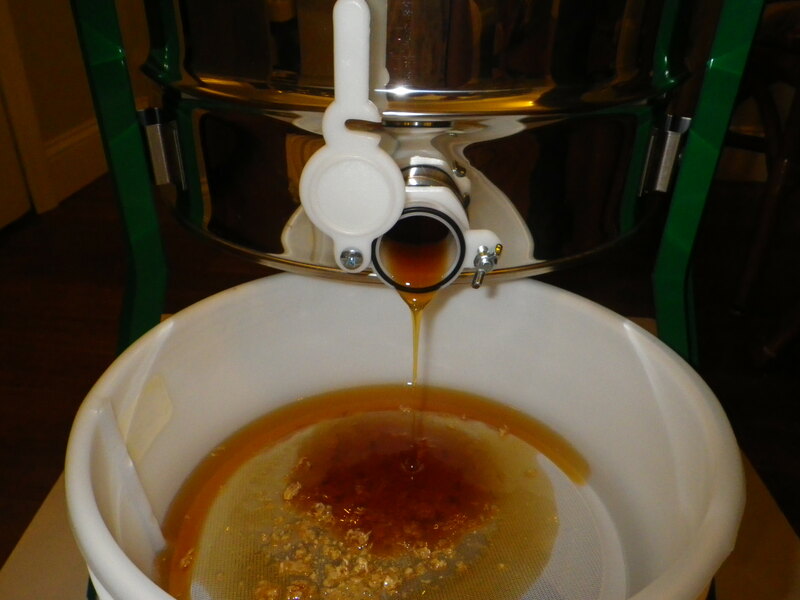 The smell of honey production was everywhere for the past few weeks, so we were anxious to see how much might be in the two honey supers. 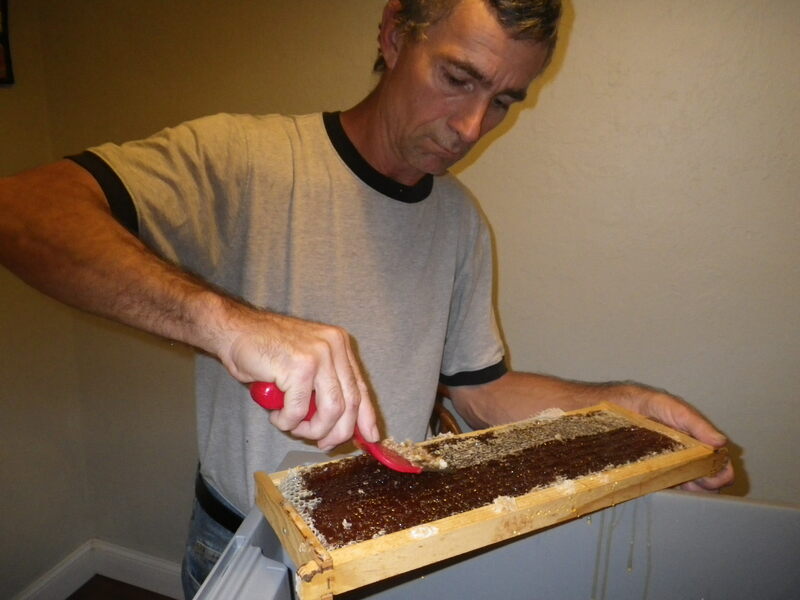 Also, the presence of open comb actually encourages honey production so it’s good practice to harvest frequently when the honey flows. We had pulled nine frames of honey in June, so we were pleasantly surprised with eight full frames for this harvest. 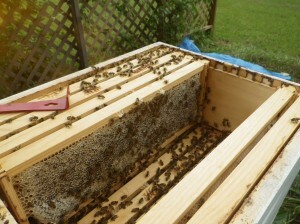 The process of harvesting gets easier with every visit to the bee box. Unfortunately, I am not gaining any immunity to bee stings, one managed to get through my shirt, and three more joined in. My elbow is swollen and hot today, but there is little pain. I applied epsom salt on a wet washcloth as soon as I could. We used a special serated knife to cut off the wax capping in the past but the knife does a lot of damage to the comb, meaning the bees have to work harder to get back to production. Clay used an uncapping tool to pull just the cap off. It takes a little longer, but it leaves the comb fairly intact. Honey gets everywhere when we start extracting, but the kids don’t complain, here a Riley Bear is digging through the cappings to find honey. I’m sure you can imagine the energy level in the house on honey day! Once uncapped, the frames go into the extractor, 4 at a time. A few minutes of spinning and the gold starts flowing. 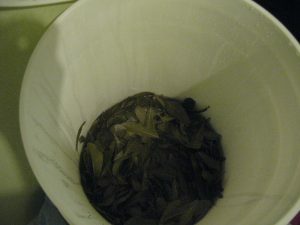 The filter catches any remaining wax and debris. 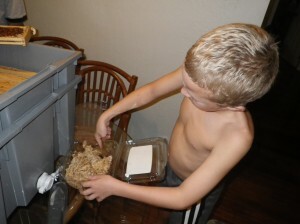 We’ll leave it in the bucket for a few days for the bubbles and any tiny debris to rise to the surface. 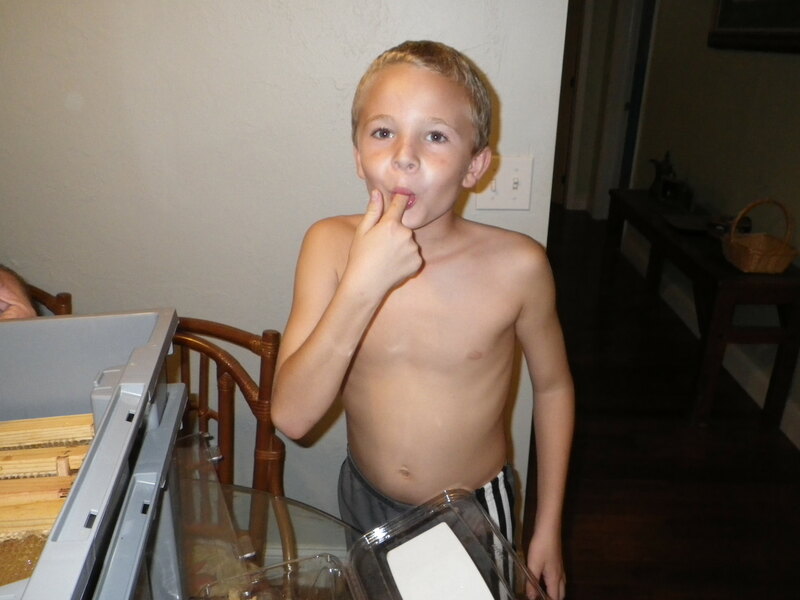 Then we jar it up and enjoy!